While the Submariner is Rolex’s most well-known and widely recognized line of watches, it was actually the Day-Date that was initially intended to be Rolex’s flagship model. 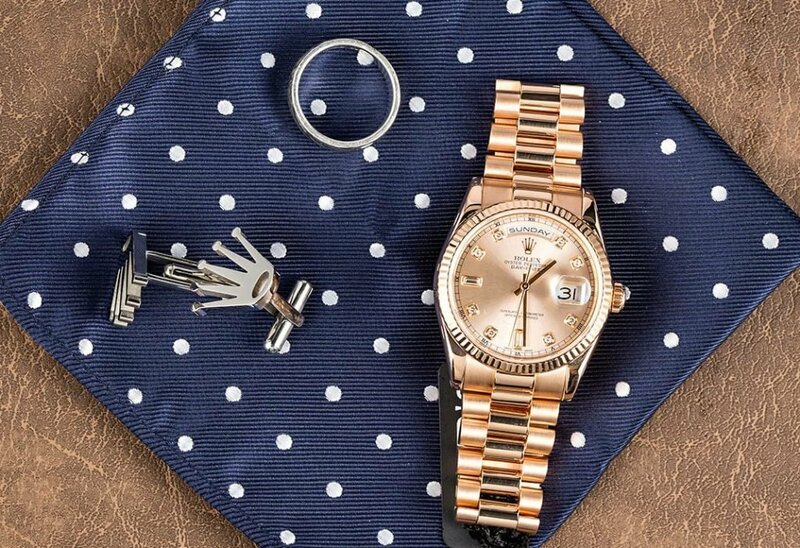 As one of Rolex’s most expensive and prestigious watch lines, the Day-Date is available in two different sizes (36mm and 40mm); and it is exclusively craft from precious metals – either 18-karat gold or solid 950 platinum. A Rolex Day Date President housed in Platinum. 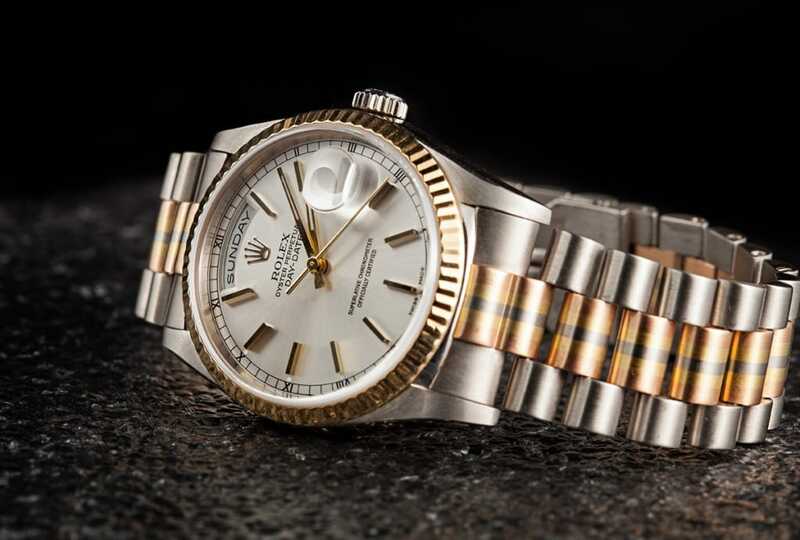 In the same spirit in which the Jubilee bracelet was specifically designed for the Datejust line of watches, the President bracelet was created specifically for the launch of the Rolex Oyster Perpetual Day-Date in 1956. 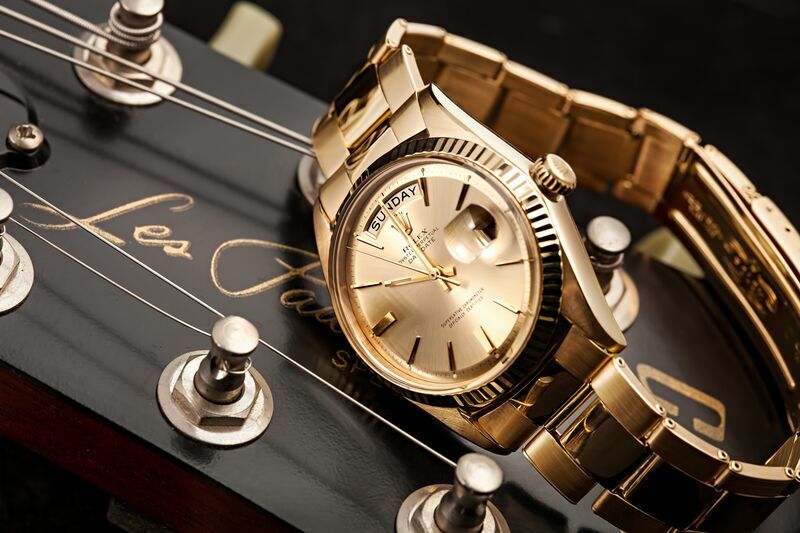 Rolex Day-Date President 1803 in all gold make for a perfect watch for any celebration. Much like the legendary line of watches for which it was designed; the President bracelet is only made from precious metals and represents the apex of comfort, refinement, and luxury. 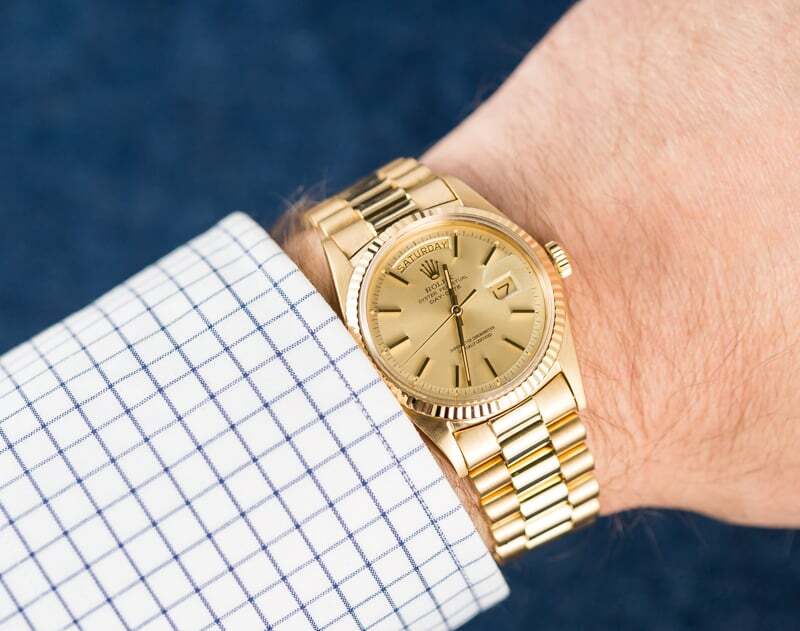 To this day, the President bracelet remains reserved for only the Rolex Day-Date line, and certain precious metal versions of the ladies Datejust line of watches. In 1965, almost 10 years after its introduction, the Rolex President bracelet officially received its now legendary name. 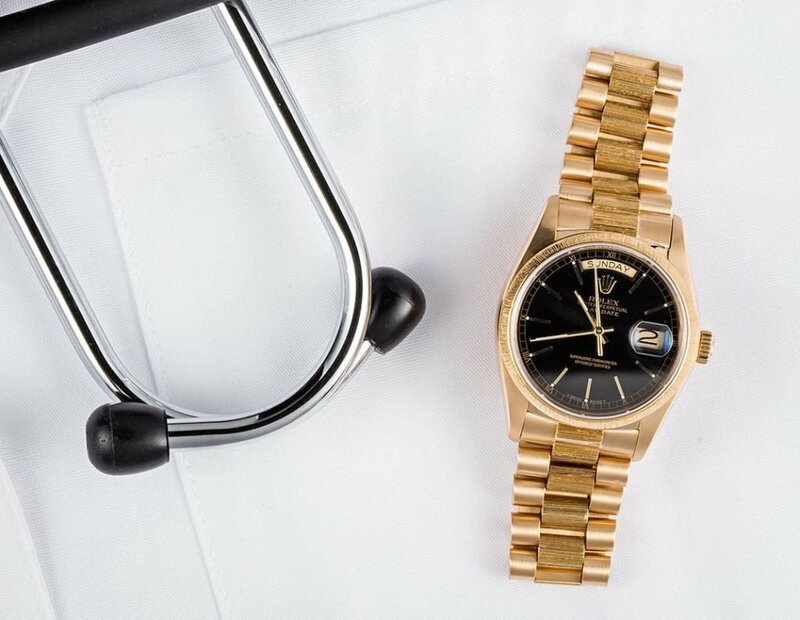 At the time, United States President, Lyndon Johnson wore a yellow gold Rolex Day-Date, and as a tribute to his choice in timepiece – and the bracelet’s exclusive use of precious metals – it was dubbed “the presidents watch” in a U.S. magazine advertisement. Rolex President ref 18078 with Bark Accents. Originally, the “President” name only referred to the semi-circular, three-piece link bracelet designed specifically for the Day-Date line of watches. However, due to their intertwined and inseparable relationship, Rolex began referring to the watch itself as the Rolex President Day-Date Chronometer during the 1980’s. 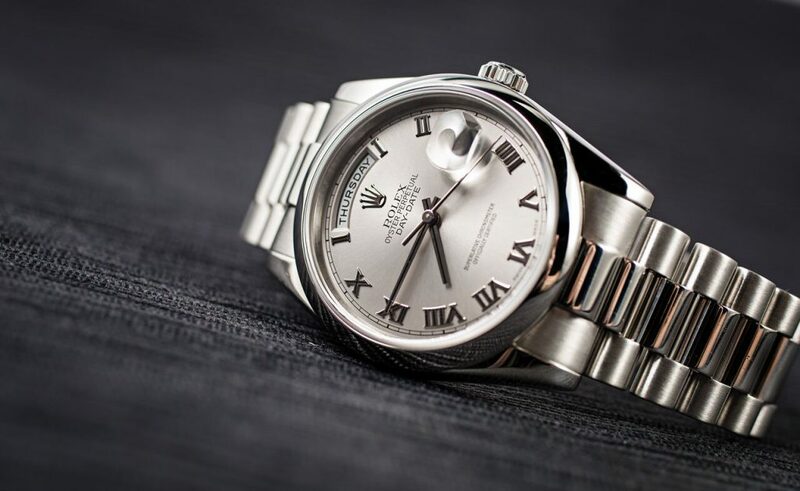 Rolex has since returned to just calling the watch the Day-Date, however the President name stuck, and now it is a cornerstone term in Rolex terminology. Originally, the “President” name only referred to the semi-circular, three-piece link bracelet. At the heart of Rolex’s Day-Date line of watches, beats either Rolex’s caliber 3155 movement (found in the 36mm model), or their caliber 3255 movement (found in the 40mm version of the Day-Date). Both movements are self-winding, and offer users 48-hours of power reserve for the caliber 3155, and 70 hours for the caliber 3255. Additionally, both movements feature double quick-set day and date complications, and allow users to hack the seconds for maximum convenience and usability. Much like Rolex’s visually similar Datejust line of watches, the Date-Date is available in a wide variety of dial colors, bezel/hour marker options, and bracelet configurations. Although no stainless steel or two-tone (Rolesor) options exist for the Day-Date, buyers do have the choice of yellow, white, or rose gold, and even solid 950 platinum of an ultra-premium look and feel. 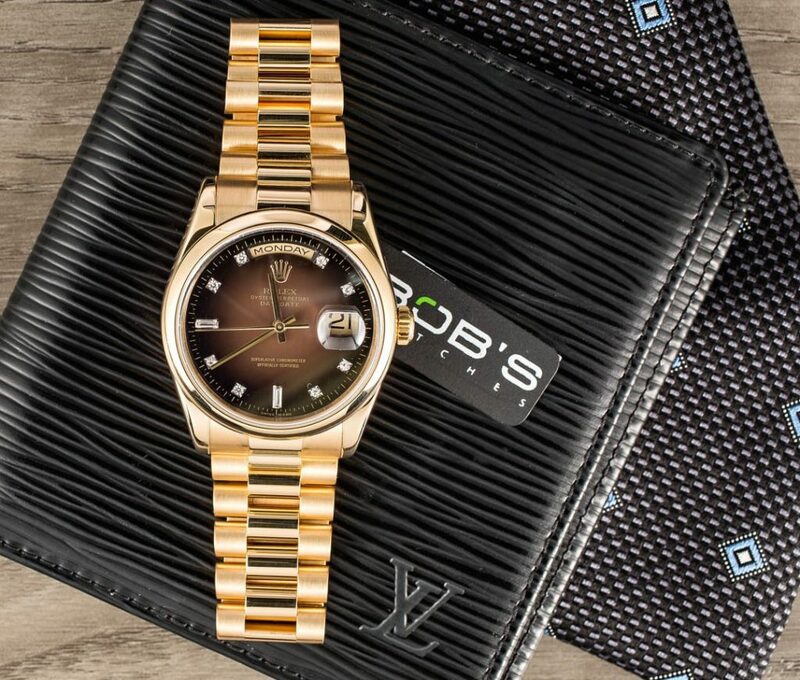 As a watch company known for being the international symbol of success, Rolex has a long history of being the watch of choice for celebrities, CEO’s, Presidents, and professional athletes. As one of Rolex’s premier lines of watches, the Day-Date is the perfect timepiece for commemorating personal success. Its exclusive use of precious metals make it a two-fold investment, and its simple, yet timeless design ensures that it will never go out of style. The Day-Date is the perfect timepiece for commemorating personal success.